Here I go again! I used French Foliage in this card one more time. I just cannot get enough of that stamp set. At my October Stamp-In workshop, my girls made another fallish card. Fallish? VERY fallish. Initially, when I had the background of leaves finished, I thought it looked kind of drab and flat. What could I do to perk it up some, to make it look more REAL? Hmmm. I know! Grab French Foliage! That always saves the day. After adding some of the French Foliage leaves and dots, even though it was subtle, it was enlivened enough to please me. Here's a close-up. Fold a piece of 5 1/2" x 8 1/2" Crumb Cake card stock in half, creasing well with a bone folder. Distress the edges of a 5 1/4" x 4" piece of Bravo Burgundy card stock in the manner you wish. Attach this piece to the card front. 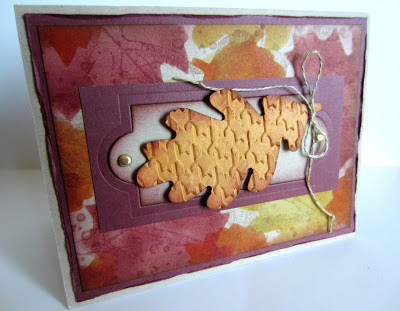 Create a stencil for the background leaves by placing a piece of card stock or quilting template plastic over the Autumn Accents Bigz Die and running it through the Big Shot. Use the negative spaces for your stencil. Save the leaves for another project. On a 5" x 3 3/4" piece of Crumb Cake card stock, place the stencil here and there, holding the stencil in place each time with blue painters tape or another removable tape. With Sponge Daubers in the appropriate colors, stencil (sponge) in the leaves. Use the leaves and distressed dots from the French Foliage set to stamp randomly across the leaves in Crumb Cake ink. This is a subtle effect, but enough to give the sponged leaves a bit more dimension. Run a 4 1/4" x 2" piece of Bravo Burgundy card stock through the Big Shot inside the rounded end label from the Apothecary Accents Framelits. Make sure the Framelit is centered because this will be your actual frame. Repeat with a 2" x 4" piece of Crumb Cake card stock. This one doesn't need to be centered because you are just using the label itself. Sponge the edges of the Crumb Cake label with Bravo Burgundy card stock with a stamping sponge. Use the Piercing Tool over the foam mat to create holes in both of the rounded ends of the label. Insert gold brads into the holes. Nestle the Crumb Cake label inside the Bravo Burgundy label frame and adhere to the card front. Run a 2 1//4" x 3 1/2" piece of More Mustard card stock through the Big Shot to create an oak leaf with the Autumn Accents Bigz Die. 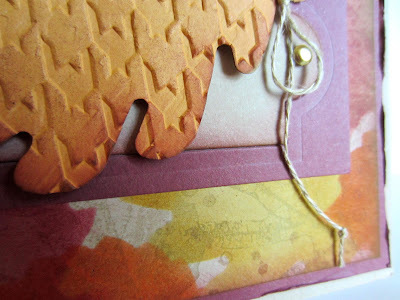 Run the leaf through the Big Shot once again inside the Houndstooth Embossing Folder. Sponge all the edges of the leaf with Bravo Burgundy ink. I also sponged lightly inside the leaf. Tie a piece of Linen Thread around the stem of the leaf in a bow. I added small knots to the ends of the thread. Attach the leaf to the card with Stampin' Dimensionals. I love to see what you have created, but this made me stop to comment. Love that stamp and the colors are wonderful. It's a beautiful card. I think I need that set. You do such great art with it! Aw, thanks, Christina. I just love that set. One of my all-time favorites! That makes me want to get my Big Shot back out and play with all my embossing stuff....but I'd have to clean off my whole desk just to get to it!!! I've got PILES of stuff all over the place and three other projects started...well, what's one more??? Right??? Thanks for sharing that gorgeous card. I love the colors! That is so pretty I love the colors. This is so pretty! Thank you for linking it up to the Saturday SHOW-licious Craft Showcase! This is perfect for this time of year...I would love for you to do a guest post so I can feature it on my site! This one is beautiful! I am new here and am following via GFC & Pinterest. Thank you, Diana! I checked out your blog, and LOVE it! I subscribed so I can keep up with you. I especially enjoy your Link Rink. What a great idea! Just one question: What's a "meme"? This is beautiful. I love it! I appreciate you sharing on "I Gotta Try That"